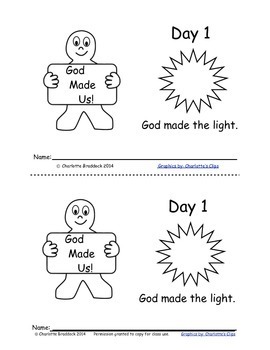 Free Bible story of Creation. 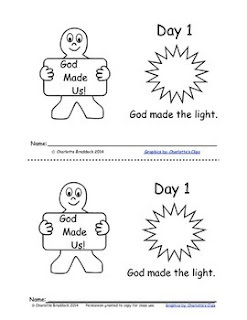 The sight words for this booklet are: made, the, and. The sentences in this little story are based on a pattern with predictable endings. The last part in each sentence changes, but can be determined by focusing on the picture clues such as sky, water, sun, moon, starts, birds, fish, Adam, Eve, etc. Permission is granted to make copies for classroom use, Sunday School, and home study. All graphics are from Charlotte's Clips.